Bomb Kills One, Injures 13 At Protest Camp In Kabul - Integration Through Media ....! (VOA): Afghan officials say a bomb that exploded Saturday near a protest site in Kabul has killed one person and wounded 13 others. The sit-in camp was started earlier in March by Afghans who support Pakistani Pashtuns who are demonstrating in Islamabad against what they call “an encounter killing” by Pakistani police. Wahid Majro, a spokesman for Afghanistan's Ministry of Public Health, confirmed the casualty figures that resulted from blast in Kabul’s eastern Chaman-e Hozoori district, which is near the Afghan national soccer team’s Ghazi Stadium. Nasrat Rahii, a deputy spokesman for the Interior Ministry, said the bomb was a magnetically attached improvised explosive device that had been planted near a tent set up by Afghan activists who support the ongoing mass protests by Pashtuns in Pakistan. There was no immediate claim of responsibility for the explosion in Kabul. The Meshrano Jirga, the upper chamber of Afghanistan’s parliament, called attention to the Kabul protest camp on March 18 by voicing support for the demonstrators in both Afghanistan and Pakistan. The Islamabad protests began after the killing in January of 27-year-old Naqibullah Mehsud during what Pakistani police described as a raid on a “terrorist hideout” in eastern Karachi. Pakistani police say Mehsud was a member of the Pakistani Taliban. 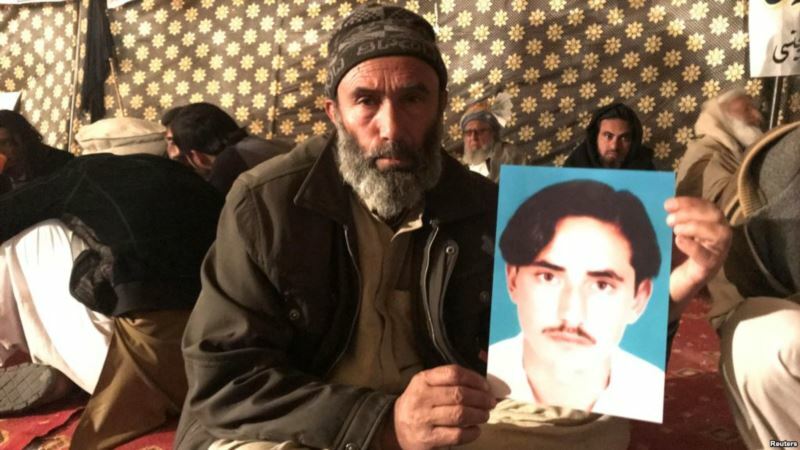 But Mehsud's relatives in South Waziristan, where he was buried, deny that he was a militant. The Pakistani demonstrators are demanding the arrest of senior Pakistani police officer Rao Anwar over Mehsud's death. They also are calling for an end to what they say is the persecution of ethnic Pashtuns in Pakistan's federally administered tribal regions. Rights groups say so-called “encounter killings” are common in Pakistan. They describe the killings as situations when police do not have enough evidence against a suspect to convict them in court and carry out an extrajudicial killing. The Human Rights Commission of Pakistan, an independent rights organization in Islamabad, says Pakistani police reports during 2016 listed the killing of at least 318 suspects during raids and shoot-outs in Karachi during 2016.